Ian Woosnam career took off in 1982 when he won the Swiss Open and came eighth on the Order of Merit (prize money list). In 1991, he reached the top of the Official World Golf Rankings, eventually spending a total of 50 weeks as World Number 1. 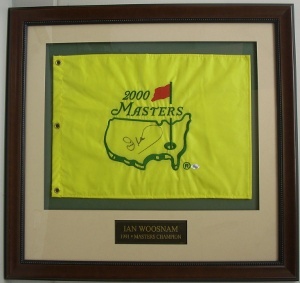 Ian Woosnam has hand autographed this 2000 Masters Flag Custom Framed. FI Hologram and Certificate of Authenticity from Athlon Sports.